Andrei Protsouk was born in the Ukraine and graduated from the Lugansk State School of Fine Art in 1981 followed by a Masters Degree awarded to him in 1990 by the Repine Academy of Fine Arts. 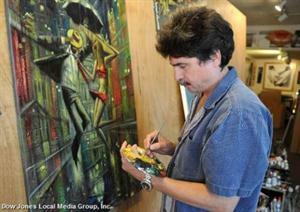 Andrei is one of the most talented artist’s of his publisher’s stable. His traditional and classic education gives him the confidence to create in whichever direction he desires. While his style is beautiful and unique, he also has the ability to paint and draw in the classic form. Indeed, his early sketch books of life form could well be mistaken for those of another well known artist, Michaelangelo. He has an artistic ability that delights.